Zivo wrote: Look at the info sheet. What a bizarre weapon. The EFP in the rear detonates first, passes through the middle of the front "grenade" and blows a hole in the target. The front "grenade" then passes through the hole made by the EFP then detonates behind the target. It has 50mm RHA penetration. I first thought where is the follow through charge and i doubted that the first one is follow through because it is a very unconventional design. Wonder what effect this follow through has on soft target inside the room. Morpheus Eberhardt wrote: As far as I know, one of the aspects of this projectile, in the configuration shown in the first picture, is that the EFP doesn't explode upon impact with the target. This is a hypersonic antitank system. This means even the Arena APS on the T 90MS will not be able to stop it . The same can be said about the other APS like LEDS 300 or Trophy . No, it still behaves like a vanilla RPG round until it hits the target. collegeboy16 wrote: No, it still behaves like a vanilla RPG round until it hits the target. Ok , so the steel/aluminum cage armor will be able to stop it or at least prevent the shaped charge jet from forming, at least some of the time. Capability against first generation APS is one of at least 4 reasons that the Russians have developed various hypersonic antitank systems. I should add that the Russians also have developed various APS that can defeat hypersonic projectiles. One other thing: this is a very old system; I personally had seen the first two and the last two pictures 20 years ago. Did you, at all, read what I wrote? Sujoy wrote: Ok , so the steel/aluminum cage armor will be able to stop it or at least prevent the shaped charge jet from forming, at least some of the time. Just ignore collegeboy; he hasn't even bothered to read the thread. Morpheus Eberhardt wrote: I should add that the Russians also have developed various APS that can defeat hypersonic projectiles. There were reports here in India that Pakistan has managed to get a few dozen RPG 30 from Lebanon with the sole intention of targeting Indian T 72 and T 90 . Therefore ,the Indian Army along with representatives of Rosoboronexport had simulated a situation where RPG 30 are used to hit a T 90 that is equipped with the Arena APS . In most cases the Arena APS was unable to stop the RPG 30 . Later the Indian Army tried the same simulation using the LEDS 300 & Trophy APS . The results were the same . The APS were unable to stop the RPG 30 . I think you might be mistaken, Lebanon has the RPG-32, not the RPG-30 (I don't know if any country outside of Russia uses the RPG-30). This might be a-bridge-too-far, and may'be I'm asking too much...is it possible you could go in-depth with all the different kinds of hypersonic projectiles developed by the Russian MOD, as well as their counter-measures? I was referring to APS of types other than the base models of Drozd, Drozd-2, and Arena and the export model Arena-Eh. Just ignore collegeboy: he hasn't even bothered to read the thread. ah, yes i prolly missed that part where the quote came from. But still such a small EFP wont do much damage to an AFV if it hits anything but the rear/top. and yes ARENA and similar gen. APS wont be able to deal with such fast targets. Afghanistan APS and like would prolly be able to protect against such weapons. magnumcromagnon wrote: I think you might be mistaken, Lebanon has the RPG-32, not the RPG-30 (I don't know if any country outside of Russia uses the RPG-30). Possible , but not likely . The RPG 32 is basically an evolution of the RPG 30 . The only difference being the RPG 32 makes use of a re-usable launch tube firing 105 mm rocket grenade . Case in point , Israeli Merkava tanks were equipped with Trophy APS and were still hit by RPG 32 . Morpheus Eberhardt wrote: I was referring to APS of types other than the base models of Drozd, Drozd-2, and Arena and the export model Arena-Eh. But then Rosoboronexport would surely have fielded the more potent version of the Arena APS ( the domestic version maybe) because it's a big contract that OEMs are after . Almost 300 T 90s to be equipped with an APS in the first tranche . The only hypersonic antitank systems that the Russians have publicized are the larger ones, like the gun based hypersonic systems (e.g., Sprut-B) and the larger missile-based (e.g., Germes) systems. The smaller ones have never been publicized, except for the unguided one that is the subject of this thread, but I can talk about them, given sufficient time and audience interest. collegeboy16 wrote: But still such a small EFP wont do much damage to an AFV if it hits anything but the rear/top. You mean, let's say, it won't do much damage to an MBT if it hits its frontal armor. The "AFV" in your statement makes the statement incorrect (as a Collegian, you should be more careful with these things). Now, even the corrected statement is out of context, and I have explained it, somewhat cryptically, in my previous posts. By the way, GSh-7VT is an FKP GkNIPAS (ФКП ГкНИПАС) development. They make many other known and unknown toys too. This round is a Bunkerfaust not an Anti-Tank weapon. It is highly doubtful it would even be useful against IFVs side armor, newer IFVs have increasingly higher side armor, i can only imagine it to be usefull against APCs like BTR, Stryker, Fuchs, Fenneck and similiar vehicles when hitting side,rear or top armor. It seems like a lot of effort just to get a relatively small explosive charge into a room, but even though the centre of the HE charge is hollow to allow the EFP to pass through, the ring of explosive and fragments would be vastly more effective exploding inside the target than a much larger charge exploding outside the target. Because it blows a small hole in the target the target remains largely structurally intact till the explosive charge goes off so the target itself contains the blast and increases its effect against those inside. This is not an anti tank weapon... it will only penetrate light vehicles or indeed rooms. Think of it as being a light APHE round for getting at troops in a room or a light vehicle. I remember reading about an RPO model which had an EFP to blow a small hole in the wall of a building to allow the thermobaric material to then flow into the room and detonate inside. This meant when firing on a building you didn't have to get the rocket to go through a window for the best effect. If you just let it go off against the outer wall the wall would protect the people inside from some of the blast effect of the weapon. With an EFP the main charge explodes inside the room and is vastly more effective... in comparison to a heavily armoured tank a 2kg HE charge outside the tank would make a noise and get the crews attention but should not penetrate the armour. 2kgs inside the tank would kill everyone. The main problem of course is getting that HE charge inside the target and the two obvious solutions is a 100kg HE charge so the blast wave just kills everyone inside, or sophisticated shaped charges to burn your way in. 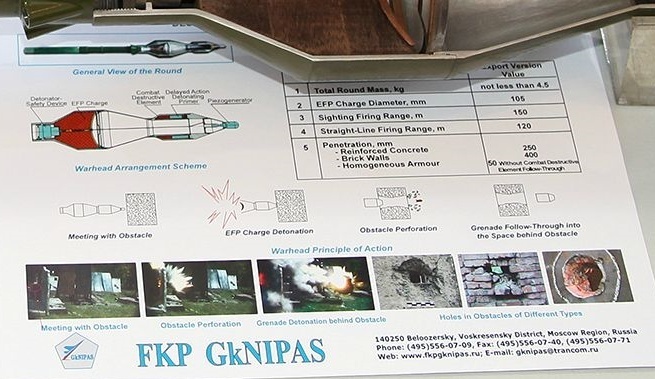 The Standard and Afghanistan systems are supposed to be able to intercept APFSDS rounds which suggests an order of magnitude improvement in performance. It is not really for defeating heavy armour it is just a way of posting a small HE charge into a container... ie motor vehicle, Room in a building, bunker, light armoured vehicle etc. A sandbagged MG or sniper position is another target where the EFP would punch through the sandbags and the HE charge will kill those inside. I rather suspect Standard and Afghanistan are secret at the moment and would not be for export. Early reports I have read described Afghanistan as the new APS system for heavy tank like vehicles, while Standard was described as being for medium and light vehicles, but I have recently read a short article that said Standard was designed for the T-95 and that Afghanistan is for the T-99 and other vehicle families. AFAIK Drozd was tested in Afghanistan and was found to be 70% effective... which makes it sound well worth the minor increase in weight and cost. No APS will be 100% effective, but then ERA and the armour on the vehicle will add to protect them from enemy fire. It penetrates up to 50mm of RHA so we are talking about penetrating Humvees and M113s, but not Bradleys or Abrams. - The new launcher will have thermobaric warheads that are 15-20% more powerful than current generation of thermobaric projectiles for the RPG-32. The 7.4 kg 105 mm HEAT tandem shaped-charge warhead will have at least 700 mm of penetration after ERA. - The average projectile speed will increase by 20-30 m/s., which will both increase accuracy and decrease time to engage targets effectively. The RPG-32 had an average projectile speed of 130-140 m/s. while the new launcher and rounds being developed will have projectiles with an average speed 160 m/s. - Increased modularity and ergonomics which will allow the new launcher to fire rounds from older generation of launchers such as the RPG-32, and the RPG-29, and will be capable to fire 105 mm projectiles, and potentially could be capable of firing 72 mm, and 60 mm projectiles. - Significant decrease/reduction in noise signature when firing, from both the launcher and the projectile. - Designed to be fired both in cities and in high altitude mount ranges. - Has great potential for future modernization. In Belarus, a new grenade launcher, which is a further development of the scheme proposed by Russian scientist, Director of the Research and Production Center "Special equipment" MSTU. Bauman (SPC "CT"), Vladimir Korenkova when creating an RPG-32 'Nashshab "(" Hashim ") for Jordan. According to the specs of power and ergonomics of new, developed by "Belspetsvneshtechnika" / LSVT / product will greatly exceed the RPG-32. Modular design allows you to use a grenade its components in other samples of weapons of this type. It is assumed that the grenade cartridge will be unified with the RPG-32 and RPG-29. "In the RPG-32 was laid combat the ideology of a decade ago. It follows from the BSVT data, cumulative power and thermobaric warheads new grenade launcher above is probably 15-20 percent, "- said in an exclusive interview with Tass Koren'kov. The expert drew attention to the prospects for the development of new combat units, and, above all, high-explosive to conduct combat operations in the city and the mountains, as well as in combat conditions when mixing products combatants. "Here ergonomics application launcher is very important. It is obvious that the Belarusian developers try to significantly reduce the noise characteristics of the shot and increase the "habitability" of the weapons are not only at the initial stage of the shot, when exiting the jet gas can create an acoustic wave, but also from the remnants of rocket fire after the release of the munition transport and launch container " - informed Koren'kov. It is assumed that the sample combat grenade will be equipped with rocket-propelled grenades caliber 105 mm weight 7.4 kg with penetration of more than 700 mm after the DMZ. The new launcher will probably like the RPG-32, multi-caliber. "It is possible that the BSVT in development and other smaller caliber grenades, for example, 72 mm or 60 mm," - said the expert. "These weapons will continue to be significant opportunities to further upgrade in comparison, for example, the Swedish grenade" Carl Gustav ", which has a limited capacity gauge" - expressed his view Koren'kov. He also drew attention to the original tail rocket propelled grenade with a tandem shaped-charge warhead, which will increase the precision and accuracy of the ammunition, as well as on the presence of a small pre-charge. "This may mean that the Belarusian side held optimization warheads on existing types used dynamic protection. Probably, the new rocket launcher will be located in an airtight container transport-launch "- expressed his view Koren'kov. The expert also drew attention to the speed of the new grenade launcher rocket propelled grenade, which will be at the level of 140-160 m / s, which exceeds the rate of ammunition RPG-32 about 30 m / s. This gives an advantage in duel situations and improves accuracy, accuracy, timeliness of application. "In general, the development seems to be one of the most promising to date, and it is definitely for the Belarusian army will be very promising" - summed up Koren'kov. It is possible that for the development and production of a new grenade Belarusian side at the end of this year, can initiate the creation of the Belarusian-Russian joint venture. Commenting on the program to create these weapons Vladimir Koren'kov noted that "the alleged cooperation between the Russian and Belarusian enterprises will be held under the procedures established by the Federal Service for Military-Technical Cooperation (FSMTC) and Russian legislation." The new thermobaric warhead has me the most excited! An increase of explosive power by 20% is pretty substantial, lets hope the explosive fire power of the new generation of thermobaric warheads could be scaled up to the RPG-28's 125 mm caliber, or if we're lucky Kornet-EM's 152 mm caliber. Has me most excited... a universal RPG able to fire all the existing and new rockets would be awesome. When I saw the RPG-32 I thought it would be neat to have a sighting package with a thermal imager and ballistics computer and laser range finder that would allow any disposable Russian/Soviet rocket launcher be attached, so the target is lazed an aimpoint appears in the sight as a glowing dot... put the dot on the target and fire. Having an attachable tube that allows RPG-29 rockets to be launched too would be an added bonus. The main problem with the RPG-29 is its fixed calibre... 105mm so larger rockets like the one in the RPG-28 at 125mm can't be used. With a clip on sight any calibre round could be used... a light vehicle doesn't need a 125mm rocket, while a 60mm rocket would struggle to effect a 70 ton tank. It seems the RPO-M followed the same path with a grip launcher and sight able to mount a range of calibre rockets of different types. (Engineer rockets). New 'Bur' anti-personel RPGs are reported to be put into mass production. Soon they are supposed to become avaiable for troops. 'Bur' is a new family of anti-personel granade launchers, which seem to be direct replacement of famous 'Shmel' thermobaric grenade. It consist of a pistol grip with sight mount (optic, IR and night sight are available) plus one of grenades in disposable launchers-containers. There are HE-Frag and thermobaric grenade types. Effective firing distance is reported to be whooping 650 m. If it's true 'Bur' can be quite an effective 'small man artillery' piece for squad/platoon levels. Asf wrote: New 'Bur' anti-personel RPGs are reported to be put into mass production. Soon they are supposed to become avaiable for troops. Sounds like a great munition... It will allow troops to engage from those further distances without something like a mortar or even a RPO-A. - Speaking of which, if this "Bur" can fire thermobaric rounds, it would be in a great position to supplement the RPO-A at closer ranges... I've been thinking about a similar weapon. The concept and the lighter weight should result in lower cost per piece giving it great potential like RPG-7 to produce in such masses that it would or could sufficiently arm majority of deployed troops and granting them a great firepower with such a weapon. I just can't stop grinning when thinking about such awesome weaponary. This is an interesting weapon, I'd like to see a video of it being fired and reloaded. The entire grip+sights detach from the tube, I want to see how this process is preformed.